Because I now live in Southern California with a large population of Hispanics, I have often been mistaken for being Hispanic myself. Probably because of my mustache? (smile) I pride myself of having learned little bits of their language. But when I try to speak I end up sounding more like a caveman saying mispronounced words, thoughts and observations. In short, it was pathetic of me seeing the confused or amused look of my Hispanic friends! The looks on their kind Hispanic faces confirm my fears: they have very little idea what I am talking about! Not good. Not good at all. This makes me think. As a Christian, I reflect on this and wonder how often we sound to each other and those who are not yet believers when we speak about Jesus and his kingdom? I ask myself: How fluent in the gospel I am? When someone you know were to ask you the question, “What is the gospel?” how would you answer them? The word gospel means “good news” literally. I wonder when we share the gospel to people, does it sound like good news? In the past what has kept you from regularly sharing and applying the gospel with people more often? Is it fear? Clarity? Our unbelief? Apathy? Too busy? Fear of damaging a relationship? Or just plain indifference? If the gospel is really good news, why are we not as excited as we should? It will do us well if we think about all the many things that were accomplished on our behalf by Jesus’ perfect life, his death and resurrection. After all, this is all very good news! “Very truly I tell you, whoever hears my word and believes him who sent me has eternal life and will not be judged but has crossed over from death to life” (John 5:24 NIV). The scriptures tell us that the gospel is that God himself has come to save and restore creation in and through the work of Jesus Christ on our behalf. I find Jesus’ life very ironic. Although his life and teaching always attracted a crowd and was loved by the non-religious yet he was an outcast and surprisingly hated by the religious types of his day! They did not like the idea of grace mentioned in the verse above. The gospel does not condemn. The gospel saves and liberates. It is sad that those people during Jesus’ time were immersed and shackled in their traditions and self-righteousness. The gospel did not just happen. It is happening and it will continue to happen. Let me explain. 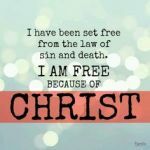 When I first got “saved”, my understanding of the gospel was pretty much focused on getting out of “hell” and where I would spend my afterlife. While it is true that Jesus’ death took my place and my sins were forgiven, yet there is something more to it. The life, death and resurrection of Jesus enable me to say “no” to the power and pull of sin in my life NOW. I now understand that Jesus’ life makes possible living the life I was created to live. I now understand that Jesus invites me to a beautiful relationship with the Father, Son and Holy Spirit. He has saved me and he desires that I enjoy the blessings that go with salvation. Here is something to think about. The gospel of Christ is inherently a missionary gospel. It is spoken. It is shared. It is lived. It is a message that changes a life, changes a course, changes affections, changes values, changes worldview, changes what we love, changes loyalty and should change either our giving and our going. The gospel does not leave us the way we are and where we are. In Christ, we are totally a new creation. Jesus is alive in each of us.